What I offer is tailor made to each and every couple with their wishes catered for throughout the complete wedding planning process. Although I offer specialised packages on request for couples that have a specific budget in mind, I do however recommend a more personalised approach to planning a couple’s wedding day. It’s not always easy to find that ideal wedding destination that ticks all the boxes….especially if you’re looking for that dream beach wedding in the sunshine. Thankfully there are some truly beautiful Lanzarote beach wedding locations to choose from that are just a short 4 hour flight from the UK & Ireland which means that family and friends can not only join you for your wedding in Lanzarote but you can also get your ultimate wish….having the sand between your toes! Lanzarote promotes that ultimate all year round sunshine which gives couples looking at having their wedding day in Lanzarote plenty of choice when considering which month to say “I do”. This means that couples are able to consider out of school holiday dates which means that their travel costs can stay relatively low, yet at the same time have great weather. It really provides brides & grooms with total reassurance when choosing whether to have their wedding in Lanzarote. Hotel Hesperia Lanzarote 5***** Resort is based in the luxurious marina of Puerto Calero. They have a gorgeous private beach that is located in the Lanz Beach Club/La Caleta Restaurant which is ideal for couples who are looking to have a private wedding in lanzarote with their family and friends. The views looking out to sea are simply stunning and the hotel provide a fabulous service from start to finish. White seat covers and same coloured sashes are provided, sound system, a choice of red/beige carpet and pergola decoration is all part of the service that can be provided by the hotel and also through myself the Lanzarote Wedding Planner. 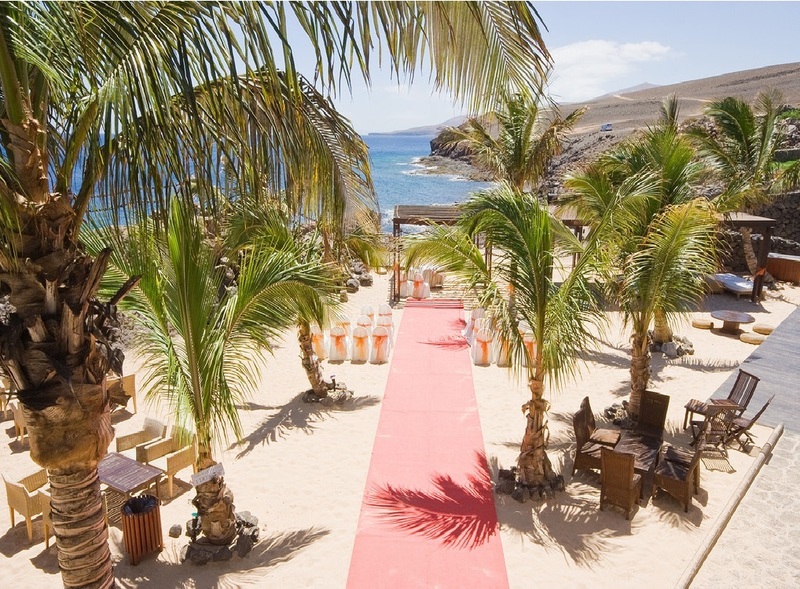 A great Lanzarote wedding venue in a fantastic setting. Imagine having your Lanzarote wedding blessing standing on the sand with the sun shining, then enjoy a cocktail reception with canapés on the decking area of the Lanz Beach Club where you have total exclusivity all day. Your Lanzarote wedding evening reception depending on that time of year and the number of wedding guests can be either outside on the sand area or inside the La Caleta Restaurant. Min of 40 guests, this place offers a selection of top class meal options including a 3 course sit down meal or a buffet depending on what you both decide. Party the night away outside or inside this wonderful Lanzarote wedding venue with a recognised DJ who can play up to 4 hours or you may decide to choose another form of entertainment. A great choice for Lanzarote weddings. Hotel Melia Salinas 5***** is located in the resort of Costa Teguise, just a short 10 minute transfer time from Arrecife Airport. One of the first Lanzarote hotels to be built, this hotel is recognised for not only it’s history but also for the fantastic facilities that this hotel has to offer. Simply enjoy your lanzarote wedding on the natural beach that is just a few steps away from being able to walk directly into the sea. 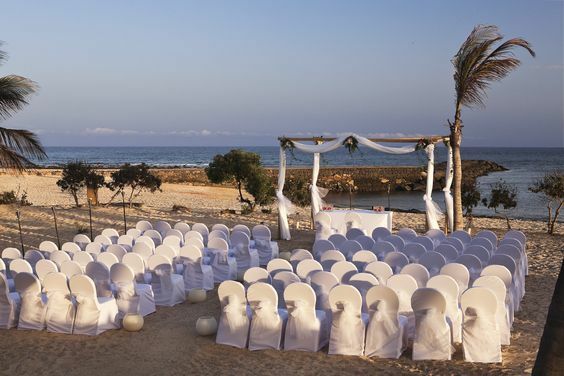 The hotel offer couples a variety of different Lanzarote beach ceremony decoration set up possibilities, from the soft ceremony to the romantic ceremony amongst other decorative ceremony options. Exchange vows whilst taking in the sea air then carry on your Lanzarote wedding celebrations at a variety of different hotel locations. The Marea Terrace is always recommended as this private upstairs balcony is exclusive for your cocktail reception just for your wedding party and you can enjoy those fabulous views whilst having your cocktail reception. Your lanzarote wedding evening reception can then take place either inside the Marea Restaurant (supplement applies) or in a designated area which is included in your wedding package. Los Cocoteros is also a beautiful spot if you’re looking at a Lanzarote wedding venue that can accommodate larger wedding party sizes. Light entertainment can be played here whilst you seat right beside the ocean. For those that are wishing to continue the wedding celebrations late into the evening, then you have the option of reserving your own private disco room until the early hours. This comes at a supplement and minimum numbers apply. A popular wedding venue that from 2017 accommodates min 50 guests. Two wonderful hotels to get married in Lanzarote and both providing a top quality wedding experience from start to finish. For more information on either of these venues, simply click on the contact form on the website with your details or alternatively email info@lanzaroteweddingplanner today. Aside from offering my direct Lanzarote wedding planning service as The Lanzarote Wedding Planner, I also work alongside Perfect Weddings Abroad, the UK’s leading wedding specialist in overseas weddings and also with Help Plan My Wedding, one of Ireland’s top wedding specialist company’s as their chosen Lanzarote wedding co-ordinator.